This art gallery reminds me of some of the hideaway ones you discover down little streets in France and Italy. Intimate space yet expansive with such stunning and lifelike art you don't know where to look first. 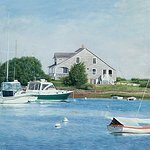 Ms. O'Malley -Keyes excels at marine art but her landscapes and portraiture are equally as special. She captures the Cape's light and essence like no other living artist. The artist herself is such a treasure and so warm ... a truly beautiful soul which is reflected in her work. A singular gallery on the Cape... wish I lived closer. I'm now the proud and profoundly blessed owner of "Martha's Haven!" - one of her beautiful boat and shore landscapes.